The combination of Brembo's unique knowledge in manufacturing high performance braking systems for high performance vehicles, Brembo can GUARANTEE top quality standards and the most advanced technological knowledge--it's now wonder that they are a world market leader in its sector! 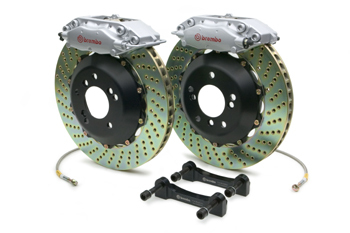 The first choice for the most sophisticated sports vehicles and high-class sedans is Brembo. Today, their skills ensures an incomparable level of performance in the best cars produced in Europe, the United States, and Japan! Brembo is perfect company partner for anyone in search of "state of the art" brake discs--no disappointments. Their company is an all-in-one design, engineering, and production company, using their outstanding knowledge of metallurgy in its braking system components design--don't expect anything less than an optimal production cycle. They have phases and tests, from research and development phases to the testing phases to static comfort tests and road tests, even dynamic tests, to finally arrive at the definition of the product and its successive marketing. With Brembo's extravagant knowledge and processes, you can be sure that you will not be disappointed in their braking systems! They have manufactured outperforming Big Brake Kits (BBK), and that will probably lead you into thinking "dust, dust, dust". Do not fear, with Brembo's 4-Piston BBKs, you have the option of integrating low dust pads to keep your wheels clean, even under intense tracking conditions!